The NEW Wireless SOHO 250 delivers the same business-class protection large organisations require at a more affordable price. 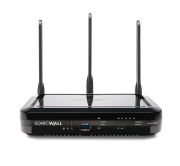 SonicWall's Wireless SOHO 250 appliance boats lighting fast performance with security processors optimised for speed. Delivering integrated 802.11 a/b/g/n wireless and operating on SonicOS, the Wirleess SOHO 250 is a smart and feature rich appliance for small networks and distributed enterprises.